"Time will not dim the glory of their deeds." The Greatest GENERATIONS Foundation is an IRS 501(c)3 Non-Governmental Organization (NGO) dedicated to acknowledging the sacrifices of veterans by sponsoring their return to visit former battlegrounds, cemeteries, and memorials to ensure that their legacies are recorded and retold in perpetuity to future generations. Just as our veterans answered their nation’s call of duty, we believe it is our responsibility to preserve their stories for future generations. We the living must ensure that their sacrifice was not in vain, but to continue the fight for liberty — not just on one day but every day. We have a responsibility to honor all of our veterans and the sacrifices they made to serve our country. We are a better nation because of their service and sacrifice. "Let Us Pledge That Their Lives, Their Sacrifices, Their Valor Shall Be Justified And Remembered." We seek to educate future Americans to fully appreciate the sacrifices that generations of Americans have made to safeguard the sovereignty of the United States. The Greatest Generations Foundation is not a governmental agency. We are a non-profit organization, and we depend on funds from memberships, donations, and grants for support. "These esteemed veterans will have died without the closure that could allow them to make sense of their sacrifices." BATTLEFIELD Return: "THE YANKS ARE COMING"
Our battlefield return programs to Normandy, France provides opportunities for veterans to preserve their stories and find closure as they return to the hallowed grounds where they served and laid to rest those they lost in battle. These sentimental programs are often emotional but provide veterans a measure of closure from their war experiences and the chance to share in the gratitude for their service, and a venue to educate others throughout communities across the globe. If you interested in participating in our return programs, please review our FAQ’s at the bottom of this page before applying. Our return programs to the battlefields of Vietnam justifies the timeless principles of peace and justice by raising awareness of the selfless courage all Vietnam War veterans exercised when they answered the call to help defend the ideals of our nation, in hopes that future generations will never forget their sacrifices or those who were left behind. If you interested in participating in our return programs, please review our FAQ’s at the bottom of this page before applying. Our Normandy World War II Leadership Experience brings young educators to the site of one of the world's most significant military operations—the 1944 Allied Liberation of France—designed to provide once-in-a-lifetime experiences for teachers and students to learn timeless lessons on leadership directly from combat veterans of World War II. These vibrant educational voyages offer life-changing experiences which not only learn volumes of history from firsthand participants but develop a renewed respect for Veterans and dramatically increased love for their country. If you are interested in participating in our leadership programs, please contact TGGF directly this page before applying. Hands Helping Heroes initiative was created by our devoted founder Timothy Davis to help provide financial support to American Veterans in need to help enrich the final years of their lives. This initiative fulfills the desires of veterans who are above the age of 80 and have served our military or sacrificed a great deal for the country as a first responder. To learn more about the initiative, or to request a lasting wish, please contact TGGF directly for more information. World War II veteran Mr. Edward Tipper received a $14000 in-house stairlift from TGGF and its supporters to help him be more mobile in his own home. Pearl Harbor survivor Mr. Jack Holder lost all of his money to a telephone scam. Thanks to TGGF and our supporters, we raised over $60,000 to help Mr. Holder live out the twilight years of his life. World War II veteran, Mr. Joseph Reilly drove an old Saturn. Thanks to TGGF and our supporters, Mr. Reilly received a new Chevrolet Cruze car to help with his school and speaking events throughout Southern California. World War II veteran Peter du Pre had one last wish "to record his first album in Nashville." At the age of 96, TGGF and our supporters, we made that possible for Mr. Du Pre. Today, he is a Nashville recording artist. GIVE BACK TO THOSE THAT HAVE PROTECTED US EVERY DAY. The Americans that have sacrificed their life's serving our great nation in uniform where part of the price forced to pay to defend human liberty and rights - we owe a debt to be paid with grateful remembrance of their sacrifice and with the high resolve that the cause for which they died shall live eternally. The Greatest Generations Foundation is not a government agency. We rely on supporters like yourself to help fund the programs that make the most significant difference for those that have served our great nation in uniform. 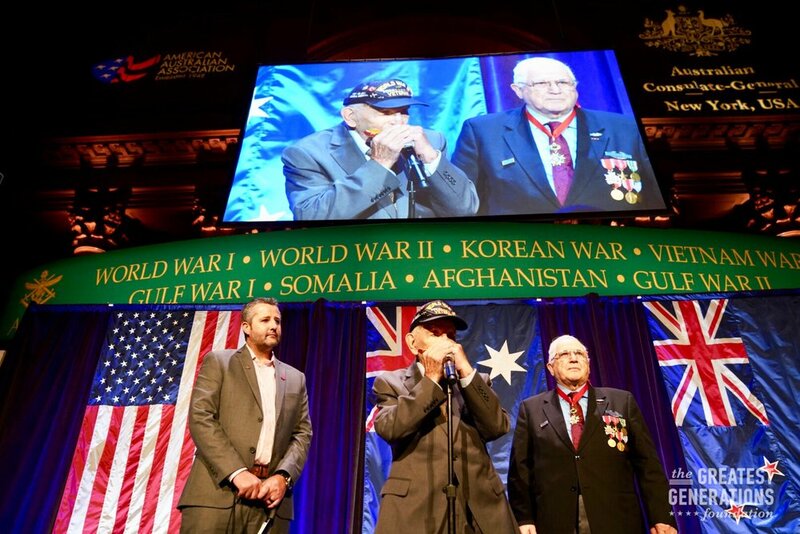 Your donations make it possible for The Greatest GENERATIONS Foundation to support and preserve the stories of our nation's veterans. Your contribution safeguards the Foundation's mission to help remember those who served every day. Your annual membership allows future generations to better appreciate the real stories of our heroes, their struggle, and sacrifice. Whatever their involvement, it deserves permanent recognition on our Memorial Wall. Become a member today and ensure that your family’s legacy is never forgotten. Make a difference at The Greatest GENERATIONS Foundation with a planned estate gift. You can trust that our experts will work to find the best options for you to leave a legacy and support our vital work. Please contact TGGF to learn more about our planned giving options. A donor-advised fund (DAF) is a charitable program that allows you to combine the most favorable tax benefits with the flexibility to support your favorite causes. If you’re representing a company looking to give back to our Nation's Veterans, we have many opportunities available for you. We invite you to explore all your options available at The Greatest GENERATIONS Foundation. We love our sponsors and hope you do too. They help us achieve our mission to honor and empower The Greatest GENERATIONS Foundation through programs, services, events, and a variety of other resources. Direct donations or grants to individuals, or groups for Veterans programs outside official TGGF programs. Religion, Medical research, or for research in the humanities. Endowments or fundraising drives, including fundraising dinners or memorials. Political campaigns, political activities or political lobbyist. Organizations are seeking capital for building or capital campaigns. Organizations involved in publishing, radio, film or television. Bradley Thomas Jr. 3104th Quartermaster from Monticello, Georgia. As a soldier in the 3104th QuarterMaster, Thomas Jr. came ashore on Omaha Beach D-Day on June 6, 1944, fought across Northern France, and during the Battle of the Bulge. He passed away July 23, 2015. Robert Blum, 97, Pearl Harbor Survivor, Purple Heart recipient, World War II and Korean War Veteran, Patriot, member of the Greatest Generation, 'Super Great Grandpa', the 'Patriarch', 'Pop' passed into his Fathers loving arms on December 22, 2016 in Lake Havasu City, Arizona. Arthur K. Staymates, 92, of Hagerstown, Maryland, passed away on April 23, 2017. He was a veteran of World War II, serving in a combat rifle company assigned to front-line duty with the 1st Infantry Division in the European Theater. Malvin Walker was born October 24, 1920 in Indianapolis, Indiana. As an officer and Army Ranger, he was aboard one of the Allied ships that fought at Omaha Beach, France. He was wounded after the initial invasion, and spent 3 months in an English hospital.Mal Walker died on October 25, 2013. He was 93. John Cipolla, 95, of Greece was awarded the Purple Heart after he was wounded three times in battle. He fought in Normandy, Holland the Battle of the Bulge with the famed Mr. Cipolla was a paratrooper in the 501st Parachute Infantry of the 101st Airborne Division. He died on September 13, 2017. He was 95. Wilson "Bill" Colwell returned to Normandy, France nearly a dozen times since D-Day. But his presence will be missed on Tuesday, when the world marks the 73rd anniversary of the allied invasion that changed the course of World War II. Colwell, who lived in Morrison, Colorado., died on Monday June 05, 2017. He was 89.